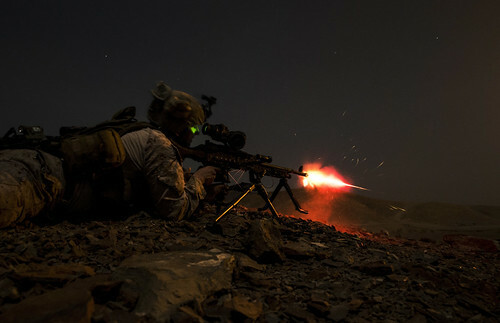 A Marine from the 13th Marine Expeditionary Unit, provides cover fire during a platoon assault exercise at Arta Range, Djibouti, Feb. 10, 2014. The 13th MEU is deployed with the Boxer Amphibious Ready Group as a theater reserve and crisis response force throughout the U.S. 5th Fleet area of responsibility. This entry was posted in Exercise and tagged night, Owning. Bookmark the permalink. My father was a WW2 U.S.Marine. He would be proud of what these pictures show the Marines are capable of now.